Amber Road. Global organizations are operating their supply chains in an environment of increasing complexity and ever-changing regulatory constraints. The product safety and compliance risks involved are persistent and costly. Most companies realize that supply chain excellence in the areas of product safety and compliance is a journey with many obstacles to address and overcome. In order to properly navigate the product safety and quality requirements for your supply stream, you need to utilize technology tools and best practices that create an efficient program for all parties involved. 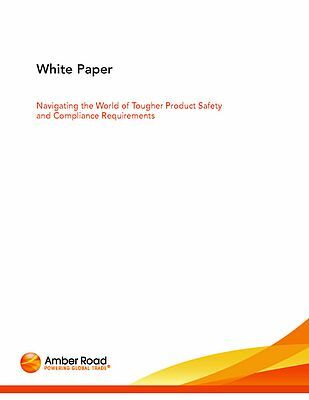 This paper reviews how global sourcing shifts influence product safety and compliance, the growing regulatory pressures from nearly every level of government, and provides approaches to help manage the increasing regulatory requirements and streamline product safety and compliance initiatives.